Rick Mines carrying out the Indigenous Community Survey in Santa Maria, California. Photo by David Bacon. Rick Mines is an agricultural economist by training. However, for the last 33 years he has focused most of his energy on survey research among Mexican farmworkers and other immigrants. The research, carried out in both the United States and Mexico, was funded both by private foundations and government agencies. Over three decades, Mines’ surveys have probed the living conditions, migration patterns, social service delivery and working conditions of generations of Mexican immigrants. He designed, implemented, and for many years managed the model farmworker survey of our period—the Department of Labor’s 20 year-old National Agricultural Workers Survey (NAWS). 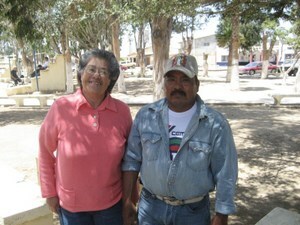 The NAWS has enabled a more accurate public perception of the characteristics of the farmworker population. Rick has always taken an active, hands-on role in all aspects of the surveys he conducted. In the current effort, Rick not only directed the Indigenous Farmworker Study, but he also designed the questionnaires, trained the interviewers, conducted many interviews himself, supervised the interview staff, cleaned and analyzed the data and wrote up reports of the findings. Rick served in the Peace Corps in Paraguay; he holds BAs in French and History from U.C. Berkeley, an MA in Latin American History from Columbia, and a Ph.D. in Agriculture and Resource Economics from U.C. Berkeley. Sandra is a cultural geographer and Visiting Scholar in Migration and Sustainable Development in the Department of Geography, U.C. Berkeley. For the Indigenous Farmworker Study she helped design and manage the study, conducted fieldwork in California and Mexico, helped write the report, took the lead developing the website and produced the videos interviews featured on this website. She has worked on migration since the mid-1990s, interviewing Mexican migrants in California and their home communities in Mexico. At the California Institute for Rural Studies in Davis she collaborated with Rick Mines, leading the Napa element of the Agricultural Workers Health Study, part of a large multi-region study commissioned by the California Endowment. She has written on transnational communities, changing cultural landscapes on both sides of the border, technology transfer, health access, nostalgia markets and sustainable agriculture. Prior to her current work, Sandra spent 22 years as a documentary filmmaker, producing numerous programs for Public Television, including the NOVA series, focusing on environment and rural development in California, Africa and Asia. Sandra grew up in Lima, Peru, is fluent in Spanish and holds a BA in Anthropology, an MA in Communication, both from Stanford, and a Ph.D. in Geography from U.C. Berkeley. 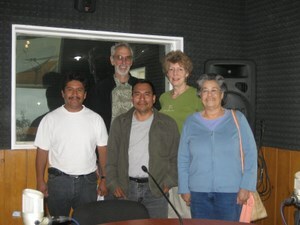 The IFS team following a radio interview at La Voz del Valle, San Quintin, Baja California. L-R: Victor Ortiz Aguilar (Mixteco radio announcer), Rick Mines, Jesus Estrada, Sandra Nichols and Anna Garcia. May 2008. Anna was trained in anthropology at the University of California, Riverside. After leaving UCR, Anna conducted field research for: the Center for U.S.-Mexican Studies (UCSD, La Jolla), Micro-Methods (Berkeley), Aguirre Division/JBS International (Burlingame), the California Institute for Rural Studies (Davis) among other institutions attempting to understand the lives of immigrant farm workers. The research was conducted in various locations throughout the U.S. and Mexico. Anna participated in the earlier CIRS project focused on community networks migrating from Oaxaca to California agriculture. Anna contributed to the survey design, the training and supervision of field interviewers, and carried out interviews in the field. David Runsten is the Director of Policy and Programs at the Community Alliance with Family Farmers (CAFF), a California statewide organization that works to develop sustainable agriculture and local food systems. He was the Associate Director of the North American Integration and Development Center at UCLA from 1995 to 2006, where he supervised research and administered the Center, as well as collaborating on research projects about the Los Angeles economy with the Los Angeles Alliance for a New Economy (LAANE). He studied economics at Stanford University and Agricultural and Resource Economics at the University of California at Berkeley. 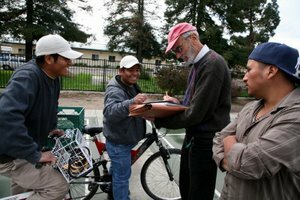 He spent seven years as Research Director of the California Institute for Rural Studies in Davis, where he conducted a series of surveys in California and Mexico on migration and the labor conditions of California farm workers. He has studied many aspects of rural Mexico and has worked with Mexican smallholder cooperatives engaged in exporting, such as the Del Cabo cooperative in Baja California. He is currently studying the impact of migration on fair trade organic coffee cooperatives in southern Mexico. The interviewers were irreplaceable for the project since they were the ones able to achieve rapport with the speakers of their native tongues. Natalia Bautista, Rafael Flores, Rosa López, Amadeo López, Paulino Martínez Castro, Arcenio López, Antonino Mateo, Catalina Navarrete, Merced Olivera, Jesús Orduña, Juan Ramón, Salvador Ramos, Nicolasa Revolledo, and Jorge San Juan. The website and the interactive maps were developed by the Geospatial Information Facility of the University of California, Berkeley. The videos were produced in collaboration with Moira Productions in Berkeley, California. Additional photographs, mostly taken in Mexico, are supplied courtesy of Rick Mines, Holly Mines and Sandra Nichols.